Perth Test: did India miss a trick in not selecting Jadeja? India remains the stronger team but the host has gained confidence and this series will continue to simmer. The aerial distance between Perth and Melbourne is 2721 kilometres and as the Indian squad flew that path on Wednesday, there would have been enough time to introspect. With the third Test at Melbourne, the traditional Boxing Day one, starting a day after Christmas, the team management opted to rightly give a three-day break to the players. The cricketers will rest their limbs, perhaps take their minds off the game, skip room-service, step out of their hotel and hopefully embrace life beyond the suitcase. But there still could be the stray thought about a script that commenced well in Adelaide but turned sour here at the Optus Stadium while the series stays balanced at 1-1. First-up, the absence of R. Ashwin, who was ruled out with an abdominal strain, ahead of the second Test, reduced Virat Kohli’s options. The off-spinner had choked Australia in the first Test, but the after-effects of his absence worsened as India opted to step in with four fast bowlers. The grass on the pitch and the general notion about it aiding pace and bounce nudged Kohli and company to take a punt. Overlooking Ravindra Jadeja and his bouquet of unerring spin, handy bat and athletic fielding, the visitors gave a berth to speedster Umesh Yadav. Part-time off-spinner Hanuma Vihari was expected to step in when the speed merchants needed to catch their breath. But the gamble did not yield the desired results once Tim Paine won the toss, elected to bat and found vindication through his openers Marcus Harris and Aaron Finch, who added 112 runs. Umesh bagged two wickets in the first innings and none in the second dig, and thus a selection experiment had backfired. The Indian attack did get its lengths right gradually but by then Australia had gone past the 300-mark. The visitor was resigned to playing catch-up for the rest of the contest and it didn t help that twice its opening partnerships failed. Six and zero isn t exactly the first step that a team can afford against Australia with its fine bowling unit of three pacers and one wily off-spinner in Nathan Lyon. Murali Vijay and K.L. Rahul need to offer assurance as a pair, but for now they are forcing their top-order colleagues to reach out for Aspirin. Kohli did all that he could through his 123 in the first innings. A revelatory knock coated in patience and lit up at times through luminous shots. But barring Ajinkya Rahane, the rest couldn t ride on the tailwind of their skipper s magnificent hundred. India suffered a 43-run deficit. In its second innings, Australia, despite Mohammed Shami s six for, managed to extend its overall lead to 286. It was going to be uphill from that point for Kohli’s men, who after offering flickers of resistance, crumbled and a 146-run defeat was the inevitable result. 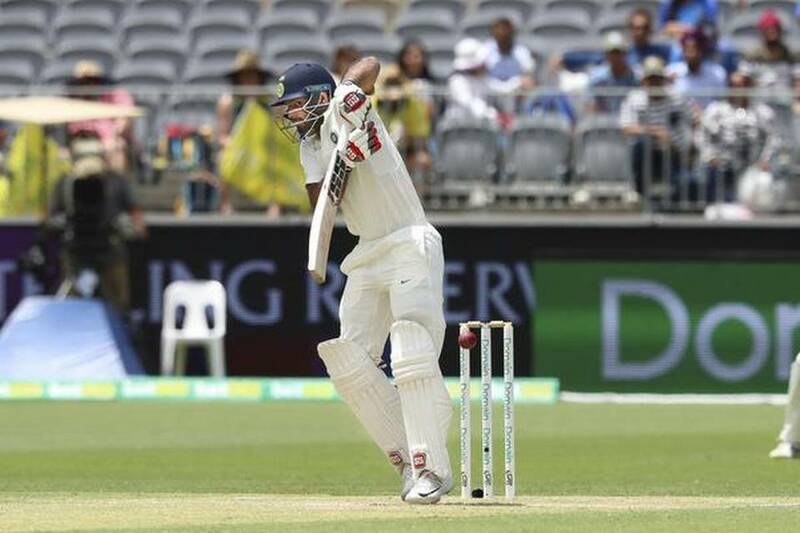 Saddled on either side with struggling openers and a long tail, the troika of Cheteshwar Pujara, Kohli and Rahane, have a heavy burden to bear. But it was heartening that Vihari, at six, battled hard. India needs to plug its batting cracks. And there should be some variety in its bowling. Interestingly on a green-tinged pitch, Lyon bagged eight wickets and though Vihari did his bit and prised out two batsmen, a frontline spinner was sorely missed. With the year drawing to a close and kids hoping for gifts from Santa Claus, this is the week to be jolly but India has a few points to ponder. It remains the stronger team but the host has gained confidence and this series will continue to simmer.